Jay is also a published author. His books include LET THERE BE LITE! (Overlook Press 1995) and THE MIDDLE PATH (Overlook Press 2002). 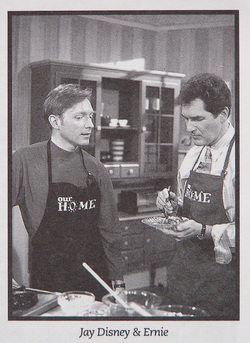 As an author, he has appeared on numerous television shows, including Food Network's Food News & Views and In Food Today as well as on Lifetime's Our Home, among others. Diet-conscious Dallasites who use the author's home-chef service are eating well indeed, judging by the wide assortment of recipes presented here. After explaining (convincingly) "How to Cook for the Week in Three Hours," which is the basis of his business, Traveling Lite, Disney sidesteps the usual low-fat revisions of high-fat dishes and instead provides original recipes derived from ethnic cuisines the world over. Here are Chervil-Laced Carrot Soup, Quiche Athenee and Imperial Navies. There are plenty of Mexican entries and quite a few parading the flavors associated with the cooking of China, India and the Middle East... An engaging raconteur, Disney serves up philosophy, commonsense cooking tips and belly laughs as well. "The Dog Chapter or, The Lowest Point in My Culinary History" about a promotional gimmick gone all wrong, provides an uproarious ending to a book worth savoring on many levels. 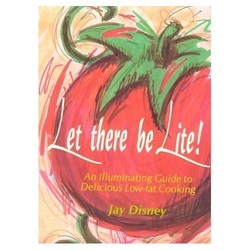 Jay Disney's holistic approach to food is inspired by the age-old, tried and true philosophy of moderation, making his new cookbook, the follow-up to Let There Be Lite! an invaluable guide to achieving balance and good health through food. He inspires readers to move beyond seeing foods as "good" or "bad" and offers common-sense guidelines to finding happiness and health through diet. He reveals the cooking techniques and shortcuts he's developed, gives innovative tips such as how to get a "meaty" taste from vegetables, shows how to make your own fresh pasta, and discusses virtually all varieties of grains and of legumes-the staples of vegetarian cuisine. 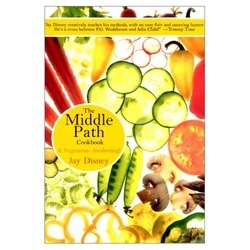 For strict vegans or for life-long carnivores who are curious about exploring the vegetarian lifestyle, The Middle Path Cookbook is filled with simple and mouth-watering meat-less recipes inspired by cuisines from around the world-an international approach that delighted fans in Let There Be Lite! From French Onion Soup to Crèpes a l'Indienne, from Kyoto Spinach & Carrots to Acorn Squash Genovese, Jay Disney's tasty recipes, favorites from his successful catering company, are both delectable and inspiring.